本发明通常涉及新颖纳米材料合成物的使用和使用它们的系统，更具体而言涉及通常包括碳和金属的纳米材料合成物，所述合成物可以被暴露到脉冲发射以使所述纳米材料合成物反应、激活、结合或烧结。 The present invention generally relates to the use of new materials composites Ying Nami systems and using them, and more particularly relates to a nano-composite material typically comprises carbon and metal, the composition may be exposed to the pulse-emitting material so that the synthetic nano reacting, activating, binding, or sintering. 可以可选地在环境温度或基于其它方法利用所述纳米材料合成物以引起这样的反应、激活、结合或烧结发生。 You may optionally be at ambient temperature or by using other methods based on the nano composite material to cause such a reaction, activation, binding or sintering occurs. 本申请是于2005年11月23日提交的申请号为200580046920. 6、名称为"金属纳米材料合成物的电、镀敷和催化使用"的专利申请的分案申请。  The present application is a continuation application No. 23 November 2005, filed 200580046920.6, entitled "metallic nano-material composites electrically, and a catalytic plating using the" divisional patent application. 本申请要求在先提交的由Kurt A. Schroder，Karl M. Martin，Dennis E. Wilson， Darrin L.Willauer，Dennis W. Hamill 和Kevin C. Walter 作为发明人的名称为"Electrical，Plating and Catalytic Uses of Metal Nanomaterial Composition'，的美国专利申请No. 60/630, 988 (2004年11月24日提交）以及由Steven C. McCool，Kurt A. Schroder和Dennis E. Wilson作为发明人的名称为"Method and System for Reacting， Activating and Sintering Nanomaterials"的美国专利申请No. 60/668, 240(2005年4 月4日提交）的优先权。  This application claims priority to prior filed by Kurt A. Schroder, Karl M. Martin, Dennis E. Wilson, Darrin L.Willauer, Dennis W. Hamill and Kevin C. Walter, as inventor entitled "Electrical, Plating US Patent and Catalytic Uses of Metal Nanomaterial Composition ', application No. 60/630, 988 (2004 Nian 11, filed May 24) and the Steven C. McCool, Kurt A. Schroder and Dennis E. Wilson, as inventor name as "Method and System for Reacting, Activating and Sintering Nanomaterials" US Patent application No. 60/668, 240 (April 4, 2005 filed) priority. 由Kurt Schroder 和Karl Matthew Martin 作为发明人的名称为"Carbon and Metal Nanomaterial Composition and Synthesis" 的2005 年8 月4 日提交的PCT 专利申请No. PCT/US2005/027711 ("PCT 05/027711申请")，该PCT专利申请要求在先提交的美国专利申请Nos. 60/598, 784 (2005年8月4日提交）和60/620, 181 (2004年10月19日提交）的优先权，这两个临时专利申请具有与PCT 05/027711申请相同的名称和发明人。  From Kurt Schroder and Karl Matthew Martin as inventors entitled "Carbon and Metal Nanomaterial Composition and Synthesis" PCT patent August 4, 2005 filed No. PCT / US2005 / 027711 ( "PCT 05/027711 application "), which earlier filed PCT patent application claims priority to US Patent application Nos. 60/598, 784 (2005 filed August 4) and 60/620, 181 filed (October 19, 2004) priority this has two provisional Patent application PCT 05/027711 application and the name of the same inventor. 由Kurt Schroder和Doug Jackson作为发明人的名称为"Nanopowder Synthesis Using Pulsed Arc Discharge and Applied Magnetic Field"的2003 年9 月24 日提交的美国专利申请No. 10/669,858。  from the Kurt Schroder and Doug Jackson as an inventor named "Nanopowder Synthesis Using Pulsed Arc Discharge and Applied Magnetic Field" US Patent September 24, 2003 filed No. 10 / 669,858. 由Kurt Schroder 和Doug Jackson 作为发明人的名称为"Radial Pulsed Arc Discharge Gun for Synthesizing Nanopowders" 的2004 年8 月17 日授权的美国专利No. 6, 777, 639。  from the Kurt Schroder and Doug Jackson as an inventor named "Radial Pulsed Arc Discharge Gun for Synthesizing Nanopowders" 2004 August 17 issued US Patent No. 6, 777, 639. 上面注明的每一个申请和专利都被受让给本发明的受让人，在这里引用它们作为参考。  Each of the above noted applications and patents are assigned to the assignee of the present invention, which is hereby incorporated by reference. 本发明通常涉及新型纳米材料合成物和其中使用它们的系统的使用，更具体而言涉及通常包括碳和金属的纳米材料合成物，可以将所述合成物暴露到脉冲辐射以反应、激活、结合或烧结所述纳米材料合成物。  The present invention generally relates to novel compositions and nanomaterials using a system using them, and more particularly relates to a nano-composite material typically comprises carbon and metal, the composition may be exposed to the pulsed radiation to a reaction, activation, binding, or sintering the composite nano material. 可选地可以在环境温度或基于其它方法利用所述纳米材料合成物以引起这样的反应、激活、结合或烧结发生。 Alternatively, at ambient temperature or may utilize other methods based on the composite nanomaterial to cause such a reaction, activation, binding or sintering occurs. 在材料加工领域中，通常加热材料以引起材料形态的特定的变化、发生特定的反应或引起相变。  In the field of material processing, particular variation is typically heated material to cause the material to form, due to occurrence of a particular reaction or phase change. 例如，在导电构图领域中，在基底上覆盖含有银片或粉末的制剂或墨，然后加热以使颗粒熔化并形成导电线路。 For example, in the field of the conductive composition, formulation or cover sheet or an ink containing silver powder on a substrate and then heating the particles melt and form a conductive trace. 在这种情况下，要求制剂是流体并且通常是绝缘的以便印刷图形，而在加工结束时其必须是固体并且是高导电的。 In this case, the formulation is required and is typically insulated from the fluid to the printing pattern, and in the end of the process it must be solid and is highly conductive. 热改变银的形态以给出希望的结果。 Thermal change the morphology of silver to give a desired result. 对于银墨，墨和基底必须被加热到达的以固化墨的温度是银的烧结温度的函数。 For the silver ink, the ink and the substrate must be heated to reach a temperature curable ink is a function of sintering temperature of silver. 对于银，熔化温度约为960°C并且烧结温度约为800°C。 For silver, the melting temperature of about 960 ° C and the sintering temperature of about 800 ° C. 该高温将基底限制为不受高温影响的材料。 The high temperature substrate is not limited to the high temperatures of the materials. 许多低成本或挠性基底例如纤维素（纸）、聚对苯二甲酸乙二醇酯（PET)、聚酯以及许多其它塑料不能经受住这些温度。 Many low or flexible substrate such as cellulose (paper), polyethylene terephthalate (PET), polyester, and many other plastics can not withstand these temperatures. 相似地，在基底上的其它元件例如有机半导体在升高的温度下同样会分解。 Similarly, other elements on a substrate such as an organic semiconductor will also decompose at elevated temperatures. 克服该限制的一种方法为使用耐较高温度的基底例如聚酰亚胺膜。 A method  to overcome this limitation is the use of high temperature resistant substrate such as a polyimide film. 虽然该方法提供耐中度高温的挠性基底，但不足够高以形成高导电膜。 Although this method provides a moderately high temperature resistant flexible substrate, but not high enough to form a high conductive film. 此外，该方法昂贵，不适合低成本应用。 Furthermore, the method expensive for low cost applications. 解决该问题的另一方法为在在固化期间收缩的树脂或聚合物中使用银片的高填充。  Another method for solving this problem is the use of silver sheet shrinkage during curing resins or polymers highly filled. 该方法迫使银片在一起，使其形成电接触。 This method forces the silver sheets together to form an electrical contact. Dow Corning的商品名为PI-2000Highly Conductive Silver Ink已经证明了该方法。 Dow Corning under the trade name PI-2000Highly Conductive Silver Ink has proven this method. 虽然该产品看来似乎在一些应用中起作用，但是因为不能被喷墨，所以该方法具有一些局限。 Although the product appears to play a role in some applications, but because they can not be inkjet, this method has some limitations. 解决该温度限制的另一方法为使用由于其小的尺寸而呈现降低的烧结温度的纳米金属。  Another method to solve the limitation of the use of temperature due to its small size and exhibits lower the sintering temperature of the metal nanoparticles. 通过将加工温度降低为约300°c-约700°C，该方法已经显示出改善。 By reducing the processing temperature of about 300 ° c- about 700 ° C, it has been shown to improve the process. 通常，为了利用降低的烧结温度，颗粒必须是分散的。 Generally, in order to reduce the use of sintering temperature, the particles must be dispersed. 多数纳米金属合成方法例如溶胶-凝胶法需要颗粒的化学表面功能化以保持颗粒分散并防止它们自发地熔化。 Most metal nano synthesis method such as a sol - gel method, chemical surface functionalization needed to keep the particles dispersed particles and prevent them from spontaneously melted. 通常需要在比银的烧结温度高的升高的温度下挥发该化学表面功能化。 This usually requires chemical surface functionalization volatile at elevated temperatures higher than the sintering temperature of silver. 即使表面功能化被设计为在烧结温度以下蒸发，烧结温度仍太高，以致不能使用一些耐较低温度的基底。 Even if the surface is designed to be functional in the evaporator below the sintering temperature, the sintering temperature is still too high to use some low temperature resistant substrate. 当工业界尝试降低加工温度时，其常常以图形的导电性为代价而实现。 When the industry attempt to reduce the processing temperature, which is often a conductive pattern is achieved at the expense. 虽然可以使用较低的加工温度，但结果通常为具有不充足的导电性的图形。 Although the use of lower processing temperatures, but the results have generally not sufficient conductive pattern. 虽然已关于导电墨描述了上述实例，但存在其中存在相同问题的相似的应用。  Although described with respect to the above example a conductive ink, similar applications where there is the same but there are problems. 例如，在催化应用中，通常将催化剂接合到耐高温基底。 For example, in catalytic applications, generally the catalyst is bonded to the substrate temperature. 为了以可接受的速率发生反应，催化剂必须处于升高的温度下。 To the reaction occurs at an acceptable rate, the catalyst must be at an elevated temperature. 这些耐高温基底通常是昂贵的并且希望用耐较低温的基底取代它们。 These substrates are generally expensive high temperature and desired to replace them with a relatively low temperature resistant substrate. 因为纳米材料的高反应性和较低的反应温度，所以纳米材料已开始用于这些应用中。 Because of high reactivity and lower reaction temperatures nanomaterials, the nanomaterials used in these applications have been started. 然而，它们仍然必须工作在典型地在较低成本的基底的工作温度之上的温度下。 However, they typically must operate at temperatures above the operating temperature of the low-cost substrate. 因此，在本领域中存在在较低温度下加工材料以允许使用更经济的基底的需要。  Accordingly, need exists in the art material processed at lower temperatures to allow for more economical use requires a substrate. 更具体而言，在导电构图市场中存在在耐低温基底上制造高导电性图形的需要。 More specifically, there is a need for producing a highly conductive pattern on a low temperature substrate is patterned in the conductive market. 本发明通常涉及新颖的纳米材料合成物的使用，所述纳米材料合成物由相对非聚集的金属颗粒组成。  The present invention generally relates to a novel use of nanomaterials composites, the nanomaterial composition of a relatively non-aggregated metal particles. PCT 05/027711申请中描述的方法制造这样的新型材料，所述新材料中的一些合成物由碳和金属组成而其它的由氧化物和金属组成。 PCT 05/027711 Application method described for producing such a novel material, some of the new composite material consisting of carbon and an oxide of other metals and metal compositions. 在这些材料自身是独特和新颖的同时，这些材料可以用于独特和新颖的应用中。 Among these materials themselves are unique and novel, while these materials may be used for the unique and novel applications. 此外，一些用途已显示出与其它纳米材料一起起作用。 Further, some applications have been shown to function along with other nanomaterials. 通过开发纳米材料中存在的独特的材料特性，实现新的用途。 Through the development of unique material properties of nanomaterials present, to realize new applications. 具体而言，已观察到纳米材料具有允许它们用于电和催化应用的属性和特性的独特的组合。 Specifically, it has been observed to allow their use for nano-material having an electrical and catalytic properties and characteristics of the application of a unique combination. 本发明可以开发这些特性并揭示在导电构图领域中的新颖的用途。  These features of the present invention can be developed and disclosed the use of a novel patterning the conductive areas. 例如，本发明可以涉及在室温或相对低的温度下使用纳米金属产生导电图形、结合纳米金属使用光子固化方法以产生高导电图形，以及结合静电复印印刷技术使用纳米金属。 For example, the present invention may involve the use at room temperature or a relatively low temperature to produce nano-metal conductive pattern, in conjunction with the metal nano using a photonic curing process to produce a highly conductive pattern, and a combination of xerographic printing techniques nano metal. 本发明的一个实施例使用碳/金属合成物以在室温下产生导电图形。 A  embodiment of the present invention, a carbon / metal composite to yield a conductive pattern at room temperature. 这通过材料在水中的任一简单分散体然后在纸基底上印刷分散体来实现。 This material in water by any of a simple dispersion of the dispersion is then printed on a paper substrate is achieved. 使用其它分散体技术也可实现在室温下在其它基底上形成导电图形。 Other techniques may also be implemented dispersion forming a conductive pattern on the other substrate at room temperature. 本发明的另一实施例通常涉及用于反应、激活或烧结纳米材料及其组合的新颖的方法。  Another embodiment of the present invention generally relates to reaction sintering to activate or novel nanomaterials and combinations thereof. 例如，本发明可以涉及纳米金属粉末例如纳米金属的加工。 For example, the present invention may relate to the processing of nano metal powders such as nano metal. 可以使用的材料的实例为金属例如但不限于银、铜、金、铂、钯、锡、锑、铟以及铅。 Examples of materials that may be used for, but not limited to metals such as silver, copper, gold, platinum, palladium, tin, antimony, indium, and lead. 在本发明中纳米（nano)是指具有小于约1微米的尺寸的材料的至少一个方面。 In the present invention, nano (Nano) means at least one aspect of a material having less than about 1 micron in size. 通常，该尺寸小于约500nm，甚至小于约100nm。 Typically, the size less than about 500 nm, or even less than about 100nm. 申请人已经观察到，一些纳米颗粒，包括多数金属纳米颗粒，通常非常能吸收光子辐射。  Applicants have observed that some nanoparticles, comprising the majority of the metal nanoparticles, is generally capable of absorbing a photon radiation. 即，颗粒表现为优良的黑体并具有对电磁辐射的高吸收率。 I.e., particles appear as a black body and has an excellent high absorption of electromagnetic radiation. 此外，与体材料相比，纳米颗粒倾向于具有较低的反射率和较差的导热性。 In addition, compared with the material, the nanoparticles tend to have lower reflectivity and poor thermal conductivity. 与微米或更大尺寸的颗粒相比，纳米颗粒还分别地具有大得多的表面积与质量比和低的热质量。 Compared with micron sized particles or larger, respectively nanoparticles further have a much larger surface area to mass ratio and low thermal mass. 这些性质表明用脉冲光子源更具体而言广播（broadcast)光子源对纳米颗粒的辐照可以瞬时地将颗粒加热至非常高的温度。 These properties indicate that a pulsed light source and more specifically, broadcast (Broadcast) photon source for irradiating the nanoparticles particles can instantaneously be heated to very high temperatures. （"光子源"为处于这样的电磁谱的辐射源，该电磁谱包括但不限于γ射线、X射线，紫外线、可见光、红外线、微波、无线电波或其组合。）该效应是非常有利的，如下面列出的几个实例所述。 ( "Photon source" such as a radiation source in the electromagnetic spectrum, the electromagnetic spectrum, including but not limited to γ-rays, X-rays, ultraviolet, visible, infrared, microwaves, radio waves or a combination thereof.) This effect is very advantageous, several examples as listed below. 本发明通过提供用于加工纳米材料的新颖的方法和系统，克服了现有技术中描述的限制。  The present invention provides a novel method and system for nanomaterials processing overcomes the limitations of the prior art described. 本发明使用高功率脉冲光子源加工纳米颗粒，同时最低限度地影响基底。 The present invention uses a high power pulsed light source nanoparticles processing, while minimally affecting the substrate. 通过这样的方法，克服了现有技术的限制。 By such a method overcomes the limitations of the prior art. 在本发明中，在表面上制造包含纳米材料的膜或图形。 In the present invention, comprising producing a film or a pattern on the surface of the nanomaterials. 可以使用这样的技术例如喷墨、丝网印刷、凹版印届IJ、静电复印、压印（stamp)、苯胺印届IJ、胶版印刷、涂抹（painting)、喷枪喷涂（airbrushing)等等，制造这样的膜或图形。 Such techniques may be used such as ink jet, screen printing, gravure printing session IJ, xerographic, embossing (Stamp), IJ session flexographic printing, offset printing, the applicator (Painting), spray gun (airbrushing) and the like, for producing such film or pattern. 所述膜或图形一旦在基底上已干燥，使所述图形经受高功率脉冲光子发射源。 Once the film has dried or pattern on the substrate, the pattern is subjected to high power pulsed light emission source. 纳米材料的高吸收率和颗粒的低热质量使它们被快速地加热，而差的导热性和短脉冲长度抑制纳米颗粒向它们的周围传递热的能力。 High absorptivity and low thermal mass of particles of nanomaterials that they are rapidly heated, and thermal conductivity and a short pulse length difference between the heat transfer inhibiting the ability of nanoparticles to the periphery thereof. 结果是，颗粒温度快速地提高到使颗粒熔化的温度。 As a result, the particles rapidly to a temperature of the melting temperature of the particles. 基底的差的传导性、低吸收率以及高的热质量确保来自光子脉冲的大量的能量用于加热颗粒，而最少的能量被传递到基底或周围元件。 Poor conductive substrate, low absorptivity and high thermal mass to ensure a large amount of energy from a photon pulse for heating of the particles, and minimal energy is transferred to the substrate or surrounding components. 通过使用在膜或图形上聚焦能量的方法和系统，本发明克服了现有技术的局限。  By using a method and system for focusing energy on the film or graphics, the present invention overcomes the limitations of the prior art. 在又一实施例中，结合光子源将纳米金属用于催化应用。  In yet another embodiment, the binding metal nano photon source used in catalytic applications. 具体而言，这可以在比现有技术低得多的温度下实现。 Specifically, this may be achieved at much lower temperatures than in the prior art. 图6示出了制造系统的示意图。  FIG. 6 shows a schematic diagram of a manufacturing system. 特别地通过碳/金属纳米合成物材料实现的一种新颖的用途为无电淀积/镀敷/ 印刷。  In particular via a carbon / metal composite nano use of a novel material for electroless deposition to achieve / plating / printing. 在本发明的一个实施例中，用将固化并具有金属导电性而不需要热固化（即环境室温）的银/碳纳米合成物材料制成导电墨。 In one embodiment of the present invention, and by having the cured electrically conductive metal without the need for thermal curing (i.e., ambient room temperature) a silver / carbon nanocomposite material conductive ink. 这样的墨可用于制造金属图形。 Such ink may be used for producing a metal pattern. 在一个实施例中，使银/碳合成物与去离子水结合，然后在回转混合器中使用氧化锆珠混合。  In one embodiment, the silver / carbon composition in combination with deionized water, and then mixed using zirconia beads in a rotary mixer. 然后在纸基底上印刷分散体或墨。 Then printed on a paper substrate a dispersion or ink. 当分散体干燥时，材料将从黑色变为银色。 When the dispersion is dried, the material from black to silver. 此外，电阻率将从无限降至约为体银的5倍。 Further, the resistivity decreased to about 5 times infinity of silver from. 一旦干燥，图形具有良好的粘附性和长期的导电性。 Once dried, the pattern having a good adhesion and long term conductivity. 假定碳、银以及纸的独特的组合能够使高导电图形得以制造。  The unique combination of assumed carbon, silver, and the paper is capable of producing highly conductive pattern. 相信水进入纸中的毛细作用可以产生迫使颗粒亲密接触的流体静压力梯度。 He believed that water enters the capillary action of the paper can be generated hydrostatic pressure gradient forces the particles intimate contact. 此外，使银颗粒保持分离的碳在水中看来似乎更加可分散并倾向于被水毛细吸出，使得裸银颗粒与纸纤维接触。 Further, the silver particles remain separated carbon appears to be more dispersible in water and capillary water tends to be drawn out, so that the bare silver particles are in contact with the paper fibers. 当彼此接触时，裸银颗粒将通过熔化减小它们的表面能，由此形成接合到纸纤维的高导电图形。 When in contact with each other, bare silver particles to reduce their surface energy by melting, highly conductive pattern is bonded to the fibers of the paper thus formed. 下列实例示例了本发明的实施例。 The following example illustrates embodiments of the present invention. 用#10绕线棒在Epson Photo Quality纸上绘下（1.0 mil湿的）墨以获得0. 09mil (2. 3微米）的干燥膜厚度。 Ink  In using a # 10 wire wound rod draw the Epson Photo Quality paper (1.0 mil wet) to obtain 0. 09mil (2. 3 microns) dry film thickness. 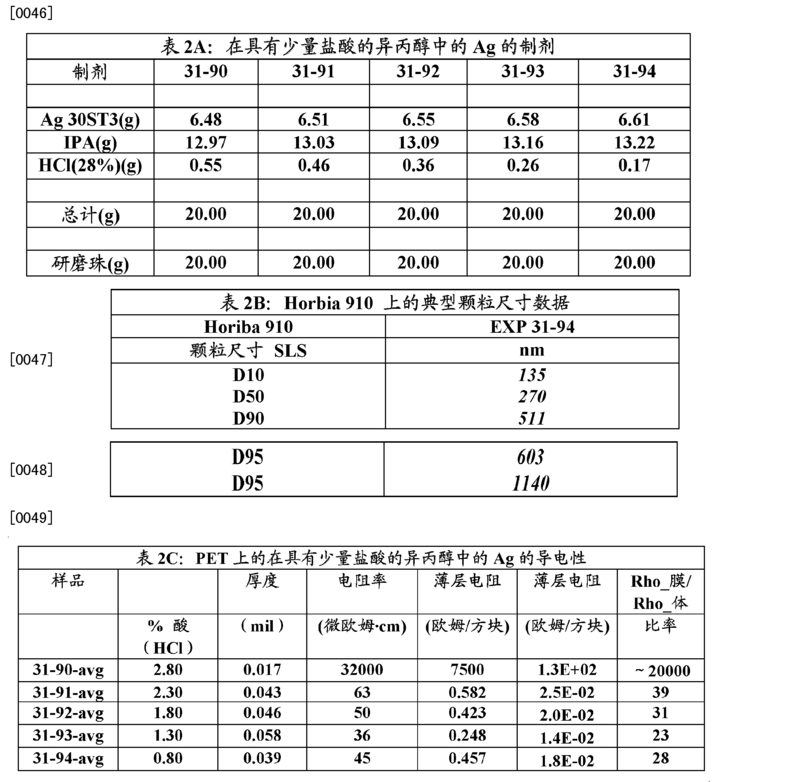 在10-30分钟内获得如表1A中所示的导电性。 Conductive obtained as shown in Table 1A, within 10-30 minutes. 然而，对其它无孔的基底例如PET应用该方法，却不能获得导电性，如表1B中所示例的。  However, other non-porous substrate such as PET using this method, can not obtain a conductive, as exemplified in Table 1B. 使用另一方法以解决在无孔的基底上涂覆的该导电性问题。  Another method used to solve the problem on the conductive substrate coated with non-porous. 在该实施例中，银/ 碳合成物悬浮在适宜的溶剂例如酒精中。 In this embodiment, the silver / carbon composition suspended in a suitable solvent such as alcohol. 用酸例如HCL处理悬浊液。 HCL e.g. treatment with an acid suspension. HCL可以蚀刻在银的表面上存在的任何氧化物并帮助静电地稳定颗粒。 HCL can etch any oxide present on the surface of the silver particles and help stabilize electrostatically. 然后将溶液声波处理并使用各种印刷技术一一例如喷墨、丝网转移、凹版印刷一一将溶液涂抹或印刷到不导电的表面例如纸、塑料或玻璃上。 The solution was then sonicated using a variety of techniques-for example ink jet printing, screen transfer, gravure printing or solution coating the eleven non-conductive surface to the paper, plastic or glass, for example. 在环境温度下，溶液可以在几分钟内干燥，所淀积的材料可以变为导电的。 At ambient temperature, the solution may be dried in a few minutes, the deposited material may become conductive. 使用该方法已获得低达36微欧姆·_的电阻率（约为固体银电阻率的23倍）。 Using this method has been as low as 36 micro-ohm · _ resistivity (about 23 times the resistivity of the solid silver). 通过将样品稍稍加热至约90°C保持30分钟，可以得到进一步的改善。 By placing the sample slightly heated to about 90 ° C for 30 minutes, it can be further improved. 在约25°C至约150°C的温度范围内进行测试，在整个温度范围内都可以看到改善。 To the test temperature range of approximately 150 ° C at about 25 ° C, in the whole temperature range can be seen to improve. 该方法的优点在于，溶剂在环境温度下蒸发，在环境温度下留下最终烧结的裸银颗粒以形成导电通路。 The advantage of this method is that at ambient temperature the solvent was evaporated, leaving a final sintered bare silver particles at ambient temperature to form a conductive path. 通过施加比目前烧结片银所需要的700°C低得多的低温，可以改善该方法。  The ratio of the current by applying a green sheet of silver of 700 ° C required a much lower temperature, the process can be improved. 表2A-2C中示出的实例2示例了在聚脂薄膜（Mylar)上该实施例的结果。 Examples 2A-2C in Table 2 shown the results of this exemplary embodiment on mylar (Mylar). 还可以将本发明的实施例用于镀敷金属例如铜或钢。  The embodiment of the present invention may also be used in embodiments of plated metal such as copper or steel. 当镀敷金属时，HCL的优点为可以在单个步骤中酸浸和镀敷基底。 When the plated metal, the advantages that can be the HCL acid leaching and plating a substrate in a single step. 该方法的另一优点为，如果需要，镀敷的厚度可以非常厚。 Another advantage of this method is, if desired, the plating thickness can be very thick. 在单个流程（pass)中可淀积100微米厚的层。 In a single process (Pass) in a 100 micron thick layer may be deposited. 然而，可以使用多个较薄的淀积获得较高的导电性。 However, deposition may be used to obtain a plurality of thin high conductivity. 因为银可以形成多孔、三维烧结的网络，镀敷的材料可以稍稍压缩或变形以符合表面。 Because silver can form a porous three-dimensional network of sintered, the plating material may be slightly compressed or deformed to conform to the surface. 这可以形成优越的电或热接触。 This can form superior electrical or thermal contacts. 当允许包含银分散体的瓶（vial)干燥时，会留下多孔的银"海绵体"。 When the bottle comprises allowing silver dispersion (Vial) sulfate, silver leave a porous "sponge." 在又一实施例中，在该网络中设置其它材料或颗粒，以给出具有独特特性的涂层。  In yet another embodiment, particles, or other materials provided in the network, so as to give a coating having unique properties. 一个实例可以为用银溶液分散其它颗粒或纤维例如氧化铝或氧化锆。 One example may be a dispersion of fibers or other particles such as alumina or zirconia with a silver solution. 最终的涂层为导电并耐刮擦的。 The final coating is electrically conductive and scratch-resistant. 这是滑动电接触所希望的。 This is a sliding electrical contact desired. 应该注意，因为与其它金属纳米颗粒导电墨相比，该颗粒相对地缺乏有机配位体， 所以该碳/银合成物很适合环境热固化导电墨应用。  It should be noted that, as compared with other metal nano-particles of the conductive ink, the particles are relatively deficient in the organic ligand, so that the carbon / silver composition is suitable thermosetting conductive ink application environment. 这意味着诱导颗粒一起开始熔化所需要的就是溶剂的蒸发。 This means that the particles begin to melt induction is required along with evaporation of the solvent. 利用使有机物附着到其的墨，在接下来发生的对纳米颗粒的烧结之前通常需要典型地大于300°C的热源以驱散或挥发有机物。 Ink adhered to the use of organic substances which generally requires typically greater than the heat source to 300 ° C prior to sintering of the nanoparticles occurs subsequent to disperse or volatile organic compounds. 由于增加了附加的工艺步骤，因此这通常是不希望的。 With the addition of additional process steps, which is usually undesirable. 加热还潜在地损伤基底和电路中的其它元件（例如有机基器件）。 Heating the substrate and also potentially damaging other components (e.g., organic based devices) circuit. 可以使用通过在表面上相对洁净的其它方法制造的任何包含颗粒的墨来制造无或低热固化墨。 Any ink may be used comprising particles produced by other methods on the opposite surface of clean or low without producing curable ink. 通过上述信息，本领域的技术人员可以认识到本发明的影响在于本发明允许使用目前常用的热固化工艺所不能使用的耐低温基底。  By the above information, one skilled in the art will recognize that the present invention is that the influence of the present invention allows the use of low temperature resistant substrate current conventional thermal curing process can not be used. 这通过显著降低生产和产品成本打开了新的市场。 This opens up new markets by significantly reducing production costs and products. 通常，耐低温基底没有耐高温基底昂贵。 Typically, low temperature substrate temperature of the substrate is not expensive. 此外，省去了与购买和在升高的温度下操作热炉有关的成本。 In addition, eliminating the cost to purchase and operate at elevated temperatures associated furnace. 下列实例示例了本发明的实施例。 The following example illustrates embodiments of the present invention. 将具有2%碳含量的18的3〇11111银注入到包含28的异丙醇和.258的37%的盐酸(剩余的为水）的瓶中，生成环境固化银涂料。 3〇11111 Silver  having a carbon content of 2% 18 injected into hydrochloric acid (the remainder being water) bottle containing 37% isopropanol and 28 .258 generates silver ambient cure coatings. 在浴器中震动并声波处理混合物30秒。 Shock in a bath and the mixture was sonicated for 30 seconds. 使用1/4"宽的画笔在一张影印纸或相似的多孔基底上涂抹分散体。（当干燥时）涂抹的痕迹约4微米厚，几英寸长并且约7mm宽。紧接在施加之后的痕迹的电阻大于20兆欧姆（超过了欧姆表的范围）。经过接下来的两到三分钟，异丙醇和盐酸开始蒸发。在这段时间期间， 电阻单调地下降到几欧姆每痕迹英寸。在施加之后20分钟，导电性变为其最终值的50% 以内；并且经过几个小时的一段时间，电阻继续降低到约0. 6欧姆每痕迹英寸。这对应于约67微欧姆的电阻率或电阻性比固体银痕迹高约45倍。在其它单位（unit)中，该痕迹的电阻为约30毫欧姆/sq/mil。在该整个时间段期间的温度为约25摄氏度。不需要热固化。痕迹看起来被接合到纸并且仅仅当纸的弯曲半径小于1毫米即锐边时剥离。透明胶带不能从纸上扯下痕迹。用于涂抹痕迹的液体分散体在其合成后提供至少3 After using the "wide paintbrush on a porous substrate a copy paper or similar dispersions. (When dry) to smear approximately 4 microns thick, several inches long and about 7mm wide. Immediately applied 1/4 traces of greater than 20 megohm resistor (beyond the scope of the ohmmeter). after the next two to three minutes, starts to evaporate isopropyl alcohol and hydrochloric acid. during this time, the resistance monotonously drops to a few ohms per inch marks. in 20 minutes after application, it becomes conductive within 50% of its final value; and a period of several hours, the resistance continues to decrease to about 0.6 ohms per inch mark which corresponds to a resistivity of about 67 micro-ohms or more. resistance of about 45 times higher than the solid silver traces. in other units (unit), the resistance of the traces is approximately 30 milliohms / sq / mil. the temperature during the entire time period of about 25 degrees C. No thermal curing . marks appear to be bonded to the paper and only when the paper is less than 1 mm bending radius of peeling i.e. sharp edge. marks the cellophane tape is not ripped from the paper. smeared liquid dispersion for providing at least 3 after its synthesis 天的一致的导电性结果。该实例与丝网或凹版印刷方法相似。 Conductive consistent results days. This example is similar to a screen or gravure printing process. 多个层。  plurality of layers. 用实例1的技术和墨分散体覆盖银纳米颗粒的薄膜。 Covered with a thin film of silver nanoparticles and the ink dispersion art example 1. 在几小时之后，4英寸长的痕迹的电阻为7. 6欧姆。 After several hours, the resistor 4 inches long marks is 7.6 ohms. 在该痕迹的顶上直接涂抹相似的痕迹。 Similar traces directly applied on top of the trace. 在几个小时之后，4 英寸长的痕迹的电阻仅为1. 〇欧姆。 After a few hours, 4 inches long traces only 1 billion ohms resistance. 无热固化喷墨印刷。  No heat curable inkjet printing. 除了将4g的异丙醇用于降低粘度以再填充Epson Stylus Photo 925printer的墨盒以外，使用与实例1相同的配方。 4g isopropanol except for reducing the viscosity to refill cartridge Epson Stylus Photo 925printer except using the same formulation as in Example 1. 使用该印刷机印刷窄至100微米的银线路。 The printing press using narrow line of silver to 100 microns. 本领域的技术人员将认识到该方法可以应用到其它金属。  Those skilled in the art will recognize that the method may be applied to other metals. 铜是一个好的实例。 Copper is a good example. 在该实施例中，两种方法形成非聚集的纳米粉末；一种使用碳，而另一种通过在制造工艺期间引入痕量的氧以产生围绕铜颗粒的氧化物壳。 In this embodiment, two methods of forming a non-aggregated nanopowders; using carbon, and the other by the introduction of traces of oxygen during the manufacturing process to produce an oxide shell around the copper particles. 在这两种情况下，纳米颗粒是相对地非聚集的。 In both cases, the nanoparticles are relatively non-aggregated. 在该情况下，刚制成的膜是不导电的，但在惰性气氛中在约150°c下加热时是导电的。 In this case, the film is made of a rigid non-conductive, but when heated at about 150 ° c in an inert atmosphere is electrically conductive. 在铜的情况下，材料如此容易氧化，以致如果不使用惰性气氛，则形成非导电的铜氧化物。 In the case of copper, such a material is easily oxidized, so that without the use of an inert atmosphere, the formation of nonconductive copper oxide. 虽然前面的实施例可以使用接下来被印刷的分散在溶剂中的纳米金属，但是存在其它的使用干燥粉末的印刷方法。  While the foregoing embodiments may use nano metal dispersed in a solvent to be printed next, but the presence of other printing method using a dry powder. 例如，激光印刷或静电复印印刷典型地使用这样的粉末或调色剂，该粉末或调色剂被静电淀积到基底上然后被加热从而熔化粉末的颗粒以产生需要的图像。 For example, laser printing or xerographic printing typically uses such a powder or toner, the toner or the powder is electrostatically deposited onto the substrate and then heated to melt the powder particles to produce the desired image. 预设方法的一个材料属性在于粉末具有高的电阻率，以便其可带有静电。 The method of the preset attribute comprising a powder material having a high resistivity, so that it can be charged with static electricity. 因此， 在该方法中不使用金属粉末。 Thus, the metal powder is not used in this method. 因为粉末具有非常高的和可控的电阻率，所以纳米金属粉末，特别地碳/金属合成物材料很适合于该应用。  Because the powder has a very high and controllable resistivity, nano metal powders, in particular carbon / metal composite materials are suitable for the application. 这允许在静电复印方法中静电地转移纳米金属粉末以直接印刷金属粉末。 This allows the xerographic process an electrostatic transfer printing nano metal powder is a metal powder directly. 在将纳米颗粒转移到印刷机之后，可以使用各种方法例如热、激光、离子束或紫外线、红外线或（下面描述的）光子固化来烧结纳米颗粒以形成导电通路。 After the transfer of the nanoparticles to the printer, various methods such as thermal, laser, ion beam or ultraviolet, infrared, or (described below) to sinter the nanoparticles photonic curing to form a conductive path. 因此，通过纳米材料得到了产生图形的一种新方法。 Thus, nanomaterials obtained by a new method of producing a pattern. 下列实例示范了本发明的不同实施例。 The following example demonstrates the different embodiments of the present invention. 去除并用具有30%碳含量的IOnm银替代来自IBM Laser printer E即Lexmark Type 4019-EOllaser printer的墨盒的调色剂。  That is removed and replaced Lexmark cartridge Type 4019-EOllaser printer of the toner from the IBM Laser printer E IOnm Silver has a carbon content of 30%. 体银粉末具有非常高的电阻。 Of silver powder has a very high resistance. 以探针间隔3/8英寸、探针深度1/2英寸的方式将欧姆表的两个探针浸入到粉末的瓶中，电阻大于20兆欧姆（欧姆表的最大量程）。 To probe spacing of 3/8 inch, 1/2 inch depth probe manner two ohmmeter probes immersed into the powder vials resistance of greater than 20 megohms (maximum range ohmmeter). 使印刷机的热加热元件不能阻止银的过早的氧化（burning)。 The heat of the heating element so that the printer can not prevent premature silver oxide (burning). 在一张规则的复印纸上记录银粉末的成功转移。 In a regular copy paper recording silver powder successful transfer. 然后需要使该张纸上的该银被烧结以便导电。 The silver is then required of the sheet of paper so that the conductive sintered. 这可使用各种技术来完成，这些技术包括但不限于机械压力、微波、电阻焊接、超声焊接或辐射方法例如在下面的金属纳米颗粒的光子激活部分中描述的激光烧结或闪光灯。 This can be accomplished using a variety of techniques, including but not limited to such mechanical pressure, microwave, resistance welding, ultrasonic welding, or photon irradiation methods described, for example in the active part of the metal nanoparticles below the flash lamp or laser sintering. 用使用这些烧结技术的该粉末镀敷对象例如塑料、木头、纺织品以及其它金属。 The powder sintering with the use of these techniques plating an object, such as plastic, wood, textiles, and other metals. 虽然碳金属合成物纳米材料特别地应为用于印刷导电通路的静电复印印刷调色剂成分，但是如果其它材料可以制造为在处于体粉末形式时具有非常高的电阻性并且可以制造成在印刷之后变得导电，那么它们也是适合的。  Although the carbon nano-metal composite material, in particular should be, but if other materials may be manufactured to have a very high resistance for xerographic printing of the toner composition printed conductive path when in powder form and may be manufactured after printing to become conductive, they are also suitable. 实例可包括被涂覆有在印刷之后可以挥发或反应完（react off)的薄介电材料的金属颗粒粉末以形成导电通路。 Examples may include metal particles may be coated with a volatilized or completion of the reaction (react off) after printing a thin dielectric material to form a conductive path. 一个实例为具有氧化物层的铜纳米颗粒。 One example is copper nanoparticles having an oxide layer. 注意，这需要在惰性气氛中进行固化以阻止形成氧化铜。 Note that this needs to be cured in an inert atmosphere to prevent the formation of copper oxide. 幸运地，下述的技术能够在空气中固化膜。 Fortunately, the following technique can be cured film in air. 本发明的另一实施例包括一种加工纳米材料以产生导电图形的方法和系统。  Another embodiment of the present invention comprises one material to produce nano-machining method and system conductive pattern. 加工纳米材料的方法和系统利用纳米颗粒与微米或体材料相比的独特的特性。 Nanomaterials processing method and system utilizes unique properties compared with the nanoparticles or micron material. 例如，与体材料特性相比，纳米颗粒倾向于具有低的反射率、高的吸收率、降低的烧结温度、较高的反应性和差的导热性。 For example, compared to the material properties, the nanoparticles tend to have low reflectivity, high absorption rate, reduce the sintering temperature, high reactivity and poor thermal conductivity. 本发明使用高功率的脉冲广播光子源来加工纳米颗粒，同时最小限度地影响基底，因此克服了现有技术的限制。 The present invention uses a high power pulsed source of photons broadcast processing to nanoparticles, while minimally affecting the substrate, thus overcoming the limitations of the prior art. 在本发明中，在表面上制造包含纳米材料的膜或图形。  In the present invention, comprising producing a film or a pattern on the surface of the nanomaterials. 可以使用这样的技术例如喷墨、丝网印刷、凹版印刷、静电复印、压印、苯胺印刷、胶版印刷、涂抹、喷枪喷涂等等，制造这样的膜或图形。 Such techniques may be used such as ink jet, screen printing, gravure printing, electrophotographic printing, embossing, flexographic printing, offset printing, painting, spray gun, etc., manufacturing such a film or pattern. 一旦膜或图形在基底上干燥，使图形经受高功率的脉冲光子发射源。 Once dried film pattern on the substrate or the pattern is subjected to a high-power pulsed light emission source. 纳米颗粒的高吸收率和颗粒的低热质量使它们被快速地加热，而差的导热性和短的脉冲长度阻止纳米颗粒向它们的周围传递热的能力。 High absorptivity and low thermal mass of particles of nanoparticles so that they are rapidly heated, and the pulse length difference between the thermal conductivity and prevent the nanoparticles short heat transfer capabilities to their surroundings. 结果为，颗粒的温度快速提高到能够使其熔化的温度。 As a result, temperature of the particles can be melted to a rapid increase in temperature. 基底的差的导热性、低的吸收率以及高热质量确保大量的来自光子脉冲的能量用于加热颗粒而最少的能量被传递到基底或周围元件。 Substrates of poor thermal conductivity, low absorptivity and high thermal mass to ensure a large amount of energy from a photon pulse for heating the particles and minimal energy is transferred to the substrate or surrounding components. 总之，能量传递到颗粒发生得如此之快，以致颗粒在它们有时间把它们的热量传递到基底之前就熔化了。 In short, the energy transfer to the particles occurs so quickly, that the particles thereof have time to transfer their heat to the substrate before the melts. 纳米颗粒的该固有鉴别能力允许脉冲广播发射以单次闪光固化大的复杂印刷图形而不会损伤基底。 The inherent ability to identify nanoparticles allow broadcast transmission pulses in a single flash cured large and complicated printed pattern without damaging the substrate. 典型地，该技术在基底上淀积lJ/cnT2的量级。 Typically, the order of deposition technique lJ / cnT2 on the substrate. 在所使用的脉冲长度，这通常低于基底的损伤水平。 The pulse length is used, this is usually lower than the level of damage of the substrate. 对于使用连续激光来烧结金属纳米颗粒膜的系统，需要100焦耳/cnT2的量级。 For continuous laser to sinter the metal nanoparticle films system, it requires on the order of 100 Joules / cnT2 of. 因为这涉及淀积高得多的面能量密度，所以通常需要使激光仅仅邻近图形地聚焦在基底的印刷图形上，否则将损伤基底。 Energy density because it involves a much higher deposition surface, is typically required only near the laser focus pattern on the printed pattern of the substrate that would otherwise damage the substrate. 此外，激光固化是连续的工艺，需要昂贵的设备和精密对准的光学系统。 Further, the laser is a continuous curing process, requires expensive equipment and precise alignment of the optical system. 当需要的面能量密度低时可以使用脉冲激光实现上述过程，并且当以重复的方式固化小的面积时这样的技术甚至是优选的。 When the low surface energy density may be required to achieve the above process using a pulsed laser, and a repetitive manner when the small area of ​​such techniques cured even preferred. 当将被固化的面积变得较大时，脉冲激光系统是较不理想的。 When the area to be solidified becomes larger, pulsed laser systems are less desirable. 在该情况下，来自气体放电的脉冲发射例如氙闪光灯变得更理想。 In this case, the pulse emitted from the discharge gas such as xenon flash lamp becomes more desirable. 对此的原因主要为经济上的，因为气体放电灯系统的硬件便宜并具有高的电至光转换效率。 The reason for this is mainly on the economy, because the gas discharge lamp system hardware cheap and has a high electrical to optical conversion efficiency. 通过闪光灯常常被用于光学地栗浦激光系统的事实，可以证明这一点。 By the fact that the flash is often used to optically pump a laser system Li, we can prove it. 此外，气体放电灯系统不需要基于激光的系统所需要的复杂的光学系统和精密对准。 Further, the gas discharge lamp system does not require a complicated optical system and a laser-based system of the precise alignment required. 另外，脉冲固态和其它脉冲发射源日益变得越来越经济。 In addition, pulsed solid-state and other pulse emission source is increasingly becoming more and more economical. 可以平行地使用多个发射源以获得广播效果。 It may be used in parallel to obtain a plurality of broadcast sources emitting effect. 因为该固化技术不在基底或周围的元件上设置显著的热负载，所以多层电路，甚至具有嵌入的器件的多层电路， 其在热脆性基底例如纸或塑料上变得更加实用。 Since this is not a substrate or curing techniques provided significant thermal load on the surrounding member, the multilayer circuit, even with the embedded multilayer circuit device, it becomes more practical in hot brittleness of the substrate such as paper or plastic. 本发明的一个实施例的方法为将纳米颗粒暴露到脉冲发射源，以使它们的形态或相改变和/或使材料反应而基本上不影响它们被包含于其内或位于其上的基底。  The method of an embodiment of the present invention is exposed to the nanoparticles pulse emission source, so that their morphology or a phase change and / or a material not substantially affect the reaction and they are contained within or located on its base. 进行几个测试，以评估固化导电墨的纳米颗粒制剂的效果。 Several tests carried out to evaluate the effect of nanoparticles cured conductive ink formulations. 在测试中，通过使不同的纳米材料与各种溶剂、表面活性剂以及分散剂混合，制备制剂，并用制剂制造膜或图形。 In the test, by mixing with a variety of different nanomaterials solvents, surfactants, and dispersants prepared formulations, and preparation for producing a film or pattern. 膜和图形被施加到基底，经受脉冲发射源，并测量导电性、粘附性、表面形态和固化深度。 Film and the graphics are applied to the substrate, is subjected to pulsed emission source, and measuring the electrical conductivity, adhesion, surface morphology, and depth of cure. 使用四点探针和测厚仪确定导电性。 Four-point probe conductivity and thickness determination. 在一些情况下，允许在经受脉冲发射源之前干燥所述膜或图形。 In some cases, the film is allowed to dry before being subjected to the pulse pattern or emission source. 当膜或图形经受脉冲发射源时，加热并烧结颗粒。  When the film is subjected to pulsed emission source pattern or heated and sintered particles. 当该情况发生时，发现该部分的图形的吸收率降低并且其反射率和导热性提高。 When this occurs, the pattern of absorption was found that portion is reduced and its reflectivity and thermal conductivity is improved. 因此该工艺是自限制的。 Therefore, the process is self-limiting. 在一些情况下， 这意味着施加单一强脉冲好于施加多个较低强度脉冲。 In some cases, this means that a single application of intense pulsed better than applying a plurality of lower intensity pulses. 在研发本发明的过程中，研究了脉冲持续时间和脉冲能量的影响。 In developing the present invention, the influence of the pulse duration and pulse energy. 传递到图形的总功率为脉冲能量、脉冲持续时间以及光足印（footprint)面积的函数。 Total power is transmitted to the pattern of pulse energy, pulse duration function and a light footprint (footprint of) the area. 使用氙闪光灯用0.7微妙-100毫秒的脉冲长度进行测试。 Test using a xenon flash lamp pulse length 0.7 msec subtle -100. 在研发中，使用约30%质量的Nanotechnologies，Inc. 30nm的银、60%质量的异丙醇以及10%质量的盐酸的混合物作为制剂，以在PET上制造导电膜。  In R & D, Nanotechnologies use of approximately 30% by mass, Inc. 30nm silver, 60% by mass of isopropanol, and a mixture of hydrochloric acid of 10% by mass of the formulation, to produce a conductive film on PET. 当图形干燥时，其导电性提高到体银的约1/20。 When the pattern was dried, to improve the conductivity of silver is about 1/20. 使用"2. 5"绕线下拉杆（draw down bar)将膜施加到3. 5mil 无光PET基底并允许膜干燥。 Use "2.5" lever (draw down bar) is applied to the film winding 3. 5mil matte PET film substrate and allowed to dry. 在一些情况下，进行多个流程。 In some cases, a plurality of processes. 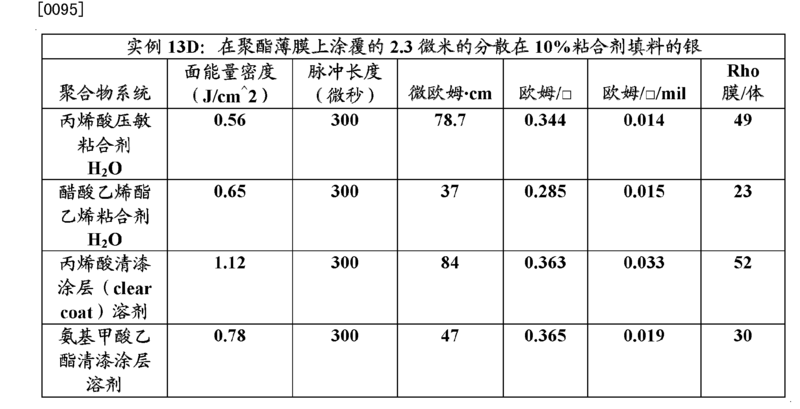 典型地，三个流程产生2-3微米厚的干燥膜。 Typically, three processes produce a dry film thickness of 2-3 microns. 在所有的情况下，膜经受脉冲后，其导电性提高。 After all cases, the film is subjected to a pulse, the conductivity is improved. 观察到导电性提高到银的导电性的约1/10、在一些情况下1/3至1/2。 Was observed to increase the conductivity of the silver conductive about 1/10, in some cases 1/3 to 1/2. 在测试中，通常发现对于给定的总能量，使用较高功率和较短脉冲长度加工的图形给出较高的导电性。 In the test, usually we found that for a given total energy, the use of higher power and shorter pattern length machining pulse is given a higher conductivity. 测试还表明，存在阈值面能量密度，如果超过该阈值面能量密度，膜会从PET表面崩落（blow off)。 The tests also show that the presence of surface energy density threshold value, if the energy density exceeds the threshold value surface, the film may caving (blow off) from the PET surface. 用超过阈值的给定的能量进行的测试表明，用长脉冲长度加工的样品具有对基底的显著的热损伤，而经受较短脉冲长度的样品显示出对基底的最小或甚至不能探察的热损伤。 Tests with a given energy exceeding the threshold value indicates that a significant thermal damage to the substrate sample long pulse length of the workpiece, and subjected to sample short pulse length showed minimal to the substrate or can not even detectors of thermal damage . 在这一系列测试中，经受较短脉冲长度的样品显示出围绕崩落图形的边缘的明显固化的银，而较长脉冲长度样品不存在这一现象。 In this series of tests, the sample is subjected to a short pulse length around the edge exhibits a distinct pattern breakouts cured silver, while the longer pulse length of the sample the absence of this phenomenon. 该证据表明较短脉冲长度可以更好地起作用。  The evidence of short pulse lengths function better. 该信息具有深远的意义。 The information has far-reaching significance. 对于短脉冲长度，可以完全地固化样品而不会对基底造成显著的损伤。 For the short pulse length, it can be fully cured sample without causing significant damage to the substrate. 这可以去除对基底的热限制并允许使用宽范围的新基底例如PET、聚酯、塑料、聚合物、树脂、织物、非织造织物、纸产品以及有机化合物。 This can remove the substrate thermal limitations and allow the use of a wide range of new substrate such as PET, polyester, plastics, polymers, resins, fabrics, nonwoven fabrics, paper products and organic compounds. 虽然该方法对于耐低温基底起作用，但是也适用于耐高温基底例如陶瓷、 合成物、层压板（laminate)、玻璃、硅以及目前用于导电构图市场中的大多数材料。 Although this method is effective at low temperature substrate, but is also applicable to high-temperature substrates such as ceramics, composites, the laminate (Laminate), glass, silicon, and patterning the conductive material for the most current market. 基底的一个应该考查的方面为其在闪光发射的波长中的吸收率。 A substrate should examine aspects of its flash emission at a wavelength in the absorption rate. 通常，基底不应具有在闪光的波长范围中的高吸收率，因为如果基底吸收闪光的能量，其或许会受到损伤。 Typically, the substrate should have a high absorptivity in the wavelength range of the flash, because the flash energy absorption if the substrate, which may be damaged. 如果需要，可以使用滤光器以去除不希望的发射带。 If desired, the use of filters to remove unwanted emission band. 测试基底是否受到发射的影响的一种方法为使没有任何图形的基底经受固化条件。 A method for testing a substrate is affected emitted without any pattern such that the substrate is subjected to the curing conditions. 然后检查基底以确定其是否受到不利的影响。 Then check the base to determine whether it is adversely affected. 图1示出了使用本发明加工的在PET上的导电膜的一部分。  FIG. 1 shows a portion of the conductive film on PET using the process of the present invention. 上部的膜示出了膜被光子固化的几个位置。 An upper film shows a few photons position of the film is cured. 下部的膜示出了使用足够的能量从基底崩落膜的几个位置。 A lower film shows a sufficient energy from the substrate using the film breakouts several locations. 注意， 在较长脉冲下存在显著更多的损伤。 Note that there is significantly more damage in the long pulses. 图2示出了具有其中导电性为体银的1/3至1/2的固化的中心区域的另一膜。  FIG 2 illustrates a film in which another conductive region of the central body of the cured silver 1/3 to 1/2. 注意来自用于测量其电阻率的四点探针的压痕（indentation)。 Note that the indentation from the four-point probe for measuring the resistivity (indentation). 还可以对使用25nm-200nm范围的不同尺寸的颗粒的银和异丙醇的制剂使用该方法。 This method can also be used for the preparation of silver and isopropanol different sizes 25nm 200nm-range particles. 在这些情况下，图形在干燥后具有无限电阻、大于40兆欧、或不可探查的导电性。 In these cases, the pattern has an infinite resistance after drying, of greater than 40 megohms, or a conductive non-probed. 在所有情况下，一旦对图形进行光子固化， 导电性提高到体银的几个数量级之内，通常在两个数量级之内。 In all cases, once the photonic curing of graphics, conductivity is improved to within a few orders of magnitude of bulk silver, usually within two order of magnitude. 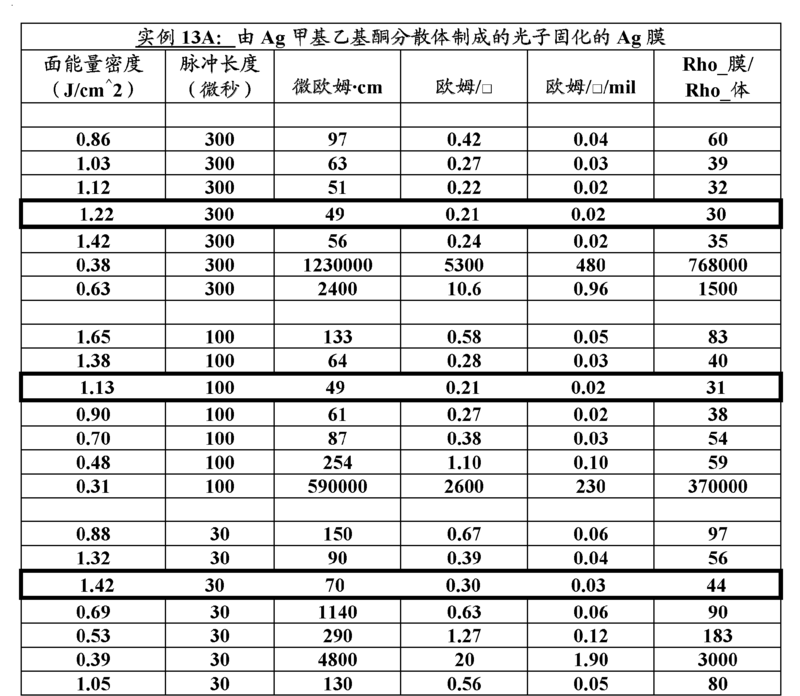 在一些情况下，导电性在体银的一个数量级之内。 In some cases, a conductivity in the order of magnitude of bulk silver. 图3示出了其中仅仅光子地固化膜的右半边的实例。 Figure 3 shows an example of the photonic only cured film wherein the right half. 在纤维素基底（纸）上覆盖银纳米颗粒的薄膜（具有上述第1节（无热固化导电墨）的实例1的墨处方，但具有10重量％的乙二醇），并使薄膜干燥。 Film  covering the silver nanoparticles on the cellulose substrate (paper) (ink formulation having the above-described example 1 section (no heat-curable conductive ink) 1, but with 10 wt% of ethylene glycol), and The film was dried. 膜的电阻约为612欧姆。 Resistance film is about 612 ohms. 当在离膜1/2"处起动来自一次性照相机（由Walgreen Co,Deerfield，IL 60015-4681 配给的Studio 35 Single Use Camera[27次曝光])的氣闪光灯泡的光的闪光后，电阻立刻降到440欧姆。随后每隔约1分钟闪光一次的闪光分别产生401、268、224以及221欧姆的电阻。 When the flash light from the flash gas in the film of 1/2 "from the start of the single use camera (manufactured by Walgreen Co, Deerfield, IL 60015-4681 dispensed Studio 35 Single Use Camera [27 impressions]) of the bubble, the resistance immediately down to 440 ohms. then about every 1 minute flash generated 401,268,224 and 221 ohms, respectively, a flash. 在纤维素基底上覆盖相似的上述纳米银的膜（具有第1节环境固化导电墨）的实例1的墨处方），并使薄膜干燥约25分钟。  Similar covering the nano silver film on the cellulose substrate (a first section having ambient cure conductive ink) ink prescription example 1), and the film was dried for about 25 minutes. 膜#1具有约3. 7欧姆的初始电阻。 Film # 1 had an initial resistance of about 3.7 ohms. 在1/4英寸-1/2英寸处来自（上述的）照相机闪光的一次闪光立刻将电阻降到3. 3欧姆。 1/4 inch from 1/2 inch (described above) is a flash camera flash resistance immediately dropped to 3.3 ohm. 一分钟后的第二闪光将电阻降到2. 5欧姆。 A minute later the resistance of the second flash will be reduced to 2.5 ohms. 一分钟后的随后的闪光没有显著地降低电阻。 It followed one minute after the flash does not significantly reduce resistance. 在140摄氏度下在炉中放置第二膜持续15分钟。 Placing a second film for 15 min in an oven at 140 degrees Celsius. 它的电阻从5. 3降到4. 0欧姆。 Its resistance from 5.3 down to 4.0 ohms. 来自照相机的两个次随后的闪光将膜的电阻分别降到3. 9和3. 8欧姆。 Two subsequent times of camera flashes from the resistive film are reduced to 3.9 and 3.8 ohms. 实际上，对基底的几次频闪（strobe) 闪光看来似乎是对低温热固化的希望的替代。 Indeed, several of the base strobe (STROBE) Flash appears to be an alternative to low temperature heat curing desired. 制造银纳米颗粒的膜，并使其在约25摄氏度下干燥10天。  The film for producing silver nanoparticles, and it was dried at about 25 degrees Celsius for 10 days. 在距表面1/2英寸处来自照相机的一次闪光瞬时地将电阻从约67降到约61欧姆。 At 1/2 inch from the surface of a single flash from a camera instantaneously reduced the resistance from about 67 to about 61 ohms. 在施加银膜之后15分钟并在膜变得干燥之后10分钟，当在距基底1/8英寸内设置照相机频闪时，当开始频闪时可听到爆裂声。  After application of the silver film in the film becomes 15 minutes and 10 minutes after drying, when disposed within the camera strobe 1/8 inch from the base, when the strobe start audible popping sound. 在该情况下，当启动照相机时放在纸的背面上的手指可以感觉到爆裂。 In this case, the finger on the paper when starting the camera on the back surface can be felt burst. 当在显微镜下观察时，发现部分膜崩落。 When viewed under a microscope, part of the membrane was found breakouts. 根据推测，这归因于邻近加热的纳米颗粒的表面的气体的快速膨胀。 Presumably, due to rapid expansion of the gas adjacent to the heating surface of the nanoparticles. 因为在放置4天的膜上也注意到响亮的爆裂声和与之相关的在纸上的压力脉冲，气体的源很可能不是未蒸发的溶剂。 Since the film for 4 days also noted loud cracking sound and associated pressure pulse on the paper, the source gas is likely not a solvent is not evaporated. 这表明如果使用强光子源，则覆盖的膜应该为薄的，或者基底应在真空中被光子源所泛射（flood)。 This means that if the use of a strong source of photons, the cover film should be thin, the substrate or pan should be shot in vacuo photon source (flood). 使用不同的溶剂制造几种银墨并对银墨进行光子固化加工。 Different  The solvent used for producing the silver ink and silver ink several photon curing process. 此外，测试为提高墨对基底的粘附力而添加粘合剂的效果。 In addition, the test ink to improve the adhesion to the substrate and the effect of addition of a binder. 第一实例为13A，其中由甲基乙基酮制成银墨。 The first example is 13A, which consists of methyl ethyl ketone is made of silver ink. 在PET上将膜厚度绘成0. 09mil或2. 29微米的厚度。 Plotted on a PET film in a thickness of 0. 09mil thickness or 2.29 microns. 使用原型光子固化系统探测不同面能量密度和脉冲宽度的结果。 System prototype photonic curing detection result of different surface energy density and pulse width. 数据表明，存在面能量密度和脉冲长度的最佳的组合以给出最好的导电性。 Data show that the optimal combination of pulse length and the presence of surface energy density as to give the best electrical conductivity. 实例13C用各种固化，约25 °C固化30分钟、约90 °C固化30分钟以及光子固化，在照片级喷墨纸上使用2. 3微米的分散在水中的银。  Example 13C with various curing, cured to about 25 ° C for 30 minutes and 90 ° C for about 30 minutes and cured photonic curing, silver 2.3 microns dispersed in water in the photo-inkjet paper. 在该实例中，由相同的制剂产生三种膜。 In this example, three membranes produced by the same formulation. 对一种膜进行93°C的温度固化30分钟，并且对另一种膜进行光子固化。 A membrane to be cured a temperature of 93 ° C for 30 minutes and another film of photonic curing. 使用最后的样品作为基准线。 The final sample used as a reference line. 注意，光子固化样品获得约5倍于体银的电阻率并且比热固化稍好。 Note that the photonic curing sample obtained about 5 times the resistivity of silver in the body and slightly better than the thermal curing. 此外，对于该低温，热固化结果很好。 In addition, for the low-temperature, heat-curable good results. 实例13D示出了在聚酯薄膜上涂覆的2. 3微米的分散在10%粘合剂填料的银。  Example 13D show coated on a polyester film of 2.3 m dispersed in a binder of 10% silver filler. 在该实例中引入不同的粘合剂以改善相对于基底的粘附性。 Introduce different adhesive in this example with respect to improve the adhesion to the substrate. 然后对样品进行光子固化工艺。 The samples were then photonic curing process. 显著的结果为，在样品从膜崩落前，粘合剂允许向样品施加高功率。 A significant result, in the sample from the film before avalanche, high power is applied to allow the adhesive sample. 较高功率还提高了墨固化的能力。 Higher power also increases the ability of the cured ink. 实例13D示出了在聚酯薄膜上涂覆的2. 3微米的分散在10%粘合剂填料的银。  Example 13D show coated on a polyester film of 2.3 m dispersed in a binder of 10% silver filler. 在该实例中，引入不同的粘合剂以改善相对于基底的粘附性。 In this example, the introduction of different adhesives in order to improve adhesiveness with respect to the substrate. 然后对样品进行光子固化工艺。 The samples were then photonic curing process. 显著的结果为，在样品从膜崩落前，粘合剂允许向样品施加高功率。 A significant result, in the sample from the film before avalanche, high power is applied to allow the adhesive sample. 较高功率还提高了墨固化的能力。 Higher power also increases the ability of the cured ink. 虽然使用Nanotechnologies，Inc.的干燥银粉末进行测试，对于用表面功能化合成的银例如由溶胶-凝胶法制备的材料，该方法同样有效。 . Although Nanotechnologies, Inc dry silver powder test, for example using a sol for surface-functionalized synthetic silver - gel prepared materials, the methods are equally effective. 在该情况下，光子方法将颗粒加热至高温，这将挥发表面有机化合物并使颗粒烧结。 In this case, the photon particles are heated to a high temperature method, which will volatilize the organic compound and the surface of the sintered particles. 此外，可以使用光子方法来提高通过热方法已经部分或完全固化的膜的导电性。 In addition, methods can be improved by using a photonic been partially or completely thermally cured conductive film. 光子方法通过使对制剂的加热与对基底的加热分隔，克服了现有技术的限制，并允许通过加热的颗粒挥发表面功能化。 The method of photons separated by heating with the heating of the formulation to the substrate, overcomes the limitations of the prior art, and allowing the volatiles by heating the surface-functionalized particles. 光子固化方法具有其它独特的优点。  The photonic curing method has other unique advantages. 典型地不使用易氧化的材料例如铜或锌来制造导电图形。 Typically do not use an oxidizable material such as copper or zinc to produce a conductive pattern. 如果使用材料例如这些金属产生墨或制剂然后加热墨或制剂以固化图形，则存在氧时金属将氧化并形成导电差或不导电的金属氧化物图形。 If these metals, for example, a material or formulation to produce ink or ink formulation and then heated to cure the pattern, the presence of oxygen to form the conductive metal oxide and a metal poor or non-conductive oxide pattern. 在加热工艺期间，颗粒的氧化发生在比烧结低的温度，因此在烧结前颗粒转变为了金属氧化物。 During the heating process, the oxide particles occurs at a temperature lower than the sintering, and therefore the particles prior to sintering to transition metal oxides. 典型地通过在真空或在惰性或还原气氛例如氢气中加工来解决该问题。 Typically, this problem is solved by processing in a vacuum or in a hydrogen atmosphere such as an inert or reducing. 所有这些选择都是昂贵的并使这些材料对于导电图形市场没有吸引力。 All of these options are expensive and unattractive for these materials conductive pattern market. 通过允许加工纳米材料而不需要受控的环境，本发明克服了使用易氧化和或活性材料的限制。  By allowing the processing of nanomaterials without a controlled environment, the present invention overcomes the limitations of the use of easily oxidized materials and or activity. 使用处于30nm-100nm范围的铜纳米颗粒进行测试。 Use in the range of 30nm 100nm-copper nanoparticles tested. 对具有氧化物钝化层的铜以及铜/碳合成物材料进行测试。 Copper and copper test / carbon composite material having oxide passivation layer. 在测试中，纳米铜被分散在异丙醇（isoproponal)中，涂覆到一张PET上并被干燥。  In the test, the copper nano-dispersed in isopropyl alcohol (isoproponal), the coated and dried onto a PET. 涂层是黑色的并具有几乎无限的电阻率。 Coating is black and has an almost infinite resistivity. 使涂层经受2. 3ms的氙广播闪光，材料立即变为铜的颜色，并且导电性提高到体铜的1/1〇〇。 Subjecting the coating 2. 3ms broadcast xenon flash material immediately becomes copper color, and to enhance the conductivity of a bulk copper / 1〇〇. 经受较高功率的闪光的另一样品显示出为体铜的1/40的导电性结果。 Another sample was subjected to flash exhibits higher power results bulk copper conductive 1/40. 通过优化颗粒氧化物层和光子条件以便接近体铜的导电性，应该获得更好的结果。 By optimizing the conditions for particle and photon oxide layer so as to approach the conductive material copper, better results should be obtained. 图4中示出了一个这样的样品，该图示出了未固化的铜膜和光固化后的膜。 Figure 4 shows one such sample, which shows the uncured film and a copper film after curing light. 可以推测，因为纳米铜的固有特性，以比氧化的时间尺度快得多的时间尺度加热并烧结颗粒，从而发生最小的氧化。 Presumably, because of the inherent characteristics of the nano-copper oxide at a much faster time scale than the time scale of heating and sintering the particles, thereby minimizing the oxidation. 这具有显著和深远的意义。 This has significant and far-reaching significance. 本发明允许在现有的和新的应用中使用在之前因为氧化问题而打折扣的低廉的材料。 The present invention allows the use of inexpensive material prior discounted because of oxidation problems in existing and new applications. 可以使用这样的材料，例如但不限于铜、铁、锌、钛、锆、镁、锡、铝、镍、钴、铟、锑、以及铅。 Such materials may be used, for example, but not limited to, copper, iron, zinc, titanium, zirconium, magnesium, tin, aluminum, nickel, cobalt, indium, antimony, and lead. 此外，可以在耐低温基底以及耐高温基底上使用这些材料。 Additionally, these materials may be used on a low temperature substrate, and the substrate temperature. 通过该方法，使用材料的组合或材料的合金同样是有用的。  By this method, the use of an alloy material or a combination of materials are also useful. 材料的组合允许加工昂贵和低廉的材料以及高导电和中度导电的材料以设计成本和导电性。 Combinations of materials allow machining expensive materials and high and low and moderate conductivity of the conductive material and the conductive design cost. 此外，可以混合两种或多种化合物，以便当加热它们时，它们可以反应或形成合金。 In addition, two or more compounds may be mixed, so that they can react or form an alloy when they are heated. -些合金在形成时会释放能量，这有助于进一步烧结材料。  - during the formation of these alloys will release energy, which contributes to further sintered material. 例如，使用具有氧化物层和少量纳米铝的铜进行测试。 For example, the copper oxide layer and having a small amount of nano-aluminum were tested. 在该情况下，氧化铜和铝在加热时将发生铝热反应。 In this case, the copper oxide and aluminum thermite reaction will take place upon heating. 该反应释放大量的热，有助于进一步加热和烧结铜。 The reaction releases a large amount of heat, further heating and sintering contribute to copper. 附带的好处在于，反应的产物为铜和氧化铝。 A side benefit is that the products of the reaction are copper and aluminum. 因此，在颗粒表面上的氧化铜转变为铜，导致了更好的导电性。 Thus, copper oxide on the surface of the particles is converted to copper, resulting in a better conductivity. 在又一实施例中，可认识到，如果较大的颗粒具有适宜的形态例如为高度成团的、 具有纳米孔或具有使它们高度吸收的极端的表面粗糙度，那么则能使用它们。  In yet another embodiment, can be appreciated, if the larger particles have a suitable form, for example, highly agglomerated, or with a nanopore having a height such that they absorb extreme surface roughness, then it can be used they. 同样，可以混合少量的微小颗粒与较大的颗粒以增加有效吸收率。 Similarly, the fine particles may be mixed with a small amount of larger particles to increase the effective absorption. 使少量的纳米铝与一些微米尺寸的铜混合、在纸上覆盖混合物的膜并使其光子地固化以使膜变为导电的示范了该构思的实施例。 A small amount of copper mixed with some of the aluminum nano-micron size, the paper cover film and allowed the mixture to photon curing of the film becomes electrically conductive in the exemplary embodiment of the concept. 在该情况下，由于铜具有低的表面积与质量比率且具有对从氙频闪发射的辐射的低的吸收率，仅仅光子地固化微米尺寸的铜是非常困难的。 In this case, since copper has a low surface area to mass ratio and having a low absorption of the radiation emitted from the xenon strobe, only photons cured micron-sized copper it is very difficult. 纳米铝的燃烧提供烧结铜所需要的附加的能量。 Combustion nanoaluminum provide additional energy needed to sinter the copper. 在由Dennis E，Wilson and Kurt A. Schroder作为发明人的名称为"System for Photonic Initiation of Nanoenergetic Materials"的在2005 年10 月25 日提交的PCT专利申请N〇.PCT/US2005/038557中公开了铝的光子激发，在此引入该申请作为参考。 By Dennis E, Wilson and Kurt A. Schroder, as inventor entitled "System for Photonic Initiation of Nanoenergetic Materials" disclosed in the PCT Patent Application N〇.PCT October 25, 2005, filed / US2005 / 038557 aluminum photon excitation, which application is incorporated herein by reference. 其它变型包括向混合物添加附加的氧化剂例如氧化铜或氧化铁、钝化铜以便为直接在将要烧结的颗粒上的铝提供氧化剂，或者向混合物添加碳黑或某种其它的纳米尺度的发射材料以使膜吸收光子辐射。 Other variations include adding to the mixture an additional oxidizing agent such as copper oxide or iron oxide, copper passivation oxidant is provided directly to the aluminum particles to be sintered or carbon black is added to the mixture, or some other nanoscale emission material photon radiation absorbing membrane. 使用由具有5-10重量％的40nm银的10微米银片（具有非常低的吸收率）构成的膜成功地制造导电图形。  using a silver sheet having a 10 microns 5-10 wt% of 40nm silver (having very low absorption) of the conductive film pattern successfully produced. 具体而言，通过单次2. 3ms的频闪闪光，痕迹的电阻从无限变为3欧姆。 Specifically, a strobe of a single 2. 3ms, the resistance becomes infinite traces from 3 ohms. 在该情况下，相信纳米粉末充当烧结助剂（aid)。 In this case, it is believed to act as a sintering aid nanopowder (aid). 虽然大多数加工的导电膜已经相当薄，即小于10mil，但是可以对较厚的膜使用本发明。  Although the majority of the conductive film has been processed quite thin, i.e. less than 10mil, the present invention may be used for thicker films. 在这些情况下，希望较长的波长和可能的较长持续时间的脉冲。 In these cases, it is desirable and possible longer wavelength pulse of longer duration. 大多数纳米粉末和/或纳米颗粒分散体通常具有可以为对数正态分布、窄分布、 宽分布、或模态（modal)分布的离散的颗粒分布。  Most nanopowder and / or nanoparticle dispersions generally have discrete particles may lognormal distribution, narrow distribution, broad distribution, or modal (Modal) distribution. 因为烧结温度是颗粒尺寸的函数，所以对于给定的粉末可以存在引起颗粒烧结的温度范围。 Because the sintering temperature is a function of particle size, the particles can be due to the presence of the sintering temperature range for a given powder. 当膜经受发射源时，一些颗粒被蒸发、一些被熔化、一些被烧结以及一些仅仅被加热是可能的。 When the film is subjected to the emission source, some of the particles is evaporated, some of which are melted, some of which are only some of the heated and sintered possible. 认识到这一点，本发明的另一实施例使用多次发射以固化样品。 Recognizing this, another embodiment of the present invention is the use of multiple emission to cure the samples. 在该实施例中，控制发射以调节烧结的量。 In this embodiment, the control transmitter to adjust the amount of sintering. 例如，使膜经受较低功率的脉冲以烧结较小的颗粒，然后经受较高功率的脉冲或脉冲的序列以烧结较大的颗粒。 For example, the film is subjected to a pulse of lower power to sinter the smaller particles, and then subjected to a sequence of pulses or pulse of higher power to sinter the larger particles. 如果一开始就使用高强度的脉冲，较小的颗粒可能蒸发，这会造成差的膜均匀性例如空隙和差的性能。 If a start pulse of high intensity, smaller particles may evaporate, which can cause voids and poor film uniformity performance difference, for example. 进行测试以确定多个脉冲是否起作用。 Test to determine whether the plurality of pulse functions. 样品经受增加强度的多个脉冲。 Samples subjected to a plurality of pulses of increasing intensity. 在每一个脉冲之后，量测导电性，发现在头几个脉冲之后导电性提高。 After each pulse, conductivity measurement, was found to improve the electrical conductivity after the first few pulses. 在约5个脉冲之后，导电性不再提高。 After about 5 pulses, no increase conductivity. 在测试的初始，观察到当在频闪在纳米材料样品附近闪光时可以听到可闻的爆裂声。  In the initial tests, it was observed when the sample in the vicinity of the strobe nanomaterial can hear audible popping sound during a flash. 该现象在疏松的纳米错粉末或疏松的纳米银粉末的情况下发生。 Occurs the case where the phenomenon of nano silver powder or loose powder wrong nano loose. 频闪越接近基底，爆裂声就变得越响。 Strobe closer to the substrate, it becomes loud popping sound. 此外，可以使用可闻的爆裂声作为用于固化膜的频闪强度的反馈机制。 Further, it is possible to use audible popping sound as a feedback mechanism for strobe strength of the cured film. 这里，新生的膜更易发出爆裂声，因为它具有非常高的发射率和非常低的热导率。 Here, the nascent membrane popped more, because it has a very high emissivity and very low thermal conductivity. 当膜被固化时，颗粒开始烧结，这使得发射率变低并且热导率变高。 When the film is cured, the particles begin to sinter, which makes the low emissivity and high thermal conductivity. 因此，来自相同强度的频闪的闪光产生越来越少的爆裂声。 Thus, the same intensity strobe flash from the cracking sound generated less. 现在，所产生的膜能够采用较高强度的脉冲而不会被损害。 Now, the film can be produced by a pulsed high intensity without being damaged. 同样，需要较高强度的脉冲以进一步固化膜。 Similarly, a higher intensity pulse is needed to further cure the film. 因为气体是频闪的强度可以在初始很高的主要原因，可选的方法为在真空中闪光基底。 Because the gas is intensity strobe may flash an alternative method the initial substrate in a high vacuum at the main reason. 在该情况下，最终的导电性可以变得更高，因为消除了作为能量传递机制的对流。 In this case, the final conductivity may become higher as convective transfer mechanism is eliminated as an energy. 在该情况下，膜可以较长时间地保持很热，并且烧结得更充分。 In this case, the film may be kept hot for a long time, and more fully sintered. 可以与热固化方法并行使用该光子固化技术，以增加效果并以比没有光子固化时低的固化温度获得相同的效果。  be used in parallel with the thermal curing method photonic curing techniques, in order to increase the effect and is not lower than a curing temperature of the photonic curing to obtain the same effect. 下面描述了能够在包括挠性电路板、平板显示器、互连、RF-ID标签以及其它一次性电子设备的耐低温基底上大量加工导电图形的商业光子固化系统。  The following describes a system capable of commercial photonic curing comprises a flexible circuit board, a flat panel display, interconnected, a large number of machining a conductive pattern on a substrate low temperature RF-ID tag and other disposable electronic devices. 所描述的商业系统能够以每分钟100英尺的速率移动并且跨越34"的宽度地加工产品。相同的设计以这样的成本依比例调节为较高的速度和较宽的格式，该成本的增加速度小于随每单位时间加工的面积的线性增加的速度。 Commercial described system 34 can be moved across and a rate of 100 feet per minute, "the width of the processed products of the same design in such a cost adjustment to scale to higher speed and the wider format, the rate of increase of the cost with less than the processing time per unit area of ​​the linearly increasing velocity. 图5示出了本发明的实施例的方法图，以及图6示出了制造系统的示意图。  FIG. 5 shows a view of an embodiment of the method of the present invention, and FIG. 6 shows a schematic diagram of a manufacturing system. 光子固化系统在种类繁多的基底上固化金属纳米墨。 Metal nano photonic curing ink curing system in a wide variety of substrates. 通过安装在独立继电器架中的高压电源和触发电路驱动多频闪头。 By driving a plurality of high voltage power supply and the first strobe trigger circuit mounted on a separate frame of the relay. 可以调整频闪头的高度以控制频闪足印。 You may be adjusted to control the height of the head strobe strobe footprints. 通过频闪电源电子地调整曝光水平。 Exposure level by adjusting the strobe power electronically. 根据未固化墨的发射率、材料特性以及膜厚度，可以调整频闪能量和脉冲持续时间以允许最优化固化而不损伤基底。 The emissivity of uncured ink, material properties, and the film thickness can be adjusted strobe energy and pulse duration to allow optimization of curing without damaging the substrate. 系统包括用于制造将被加工以制造导电图形的膜和图形601的照相制版术(process)以及用于固化膜和图形以产生导电膜或图形的系统。  The system includes means for producing a conductive pattern is processed to produce a film pattern 601 and the photolithography technique (process) as well as a system for the cured film and the conductive film to produce a pattern or pattern. 用于在基底上产生膜或图形601的系统可以为能够向表面施加纳米颗粒的现有技术例如丝网印刷、喷墨印刷、凹版印刷、激光印刷、静电复印、移印（pad printing)、涂抹、蘸水笔（dip pen)、注射（syringe)、 喷枪喷涂、平版印刷中的一种或组合。 The system 601 for generating a pattern on a film or substrate may be capable of the prior art to the surface of Shijianami particles such as screen printing, ink jet printing, gravure printing, laser printing, xerography, pad (pad printing), painting , dip-pen (dip pen), injection (Syringe), spray gun, one or combination of lithographic printing. 然后系统将具有图形的基底移动到固化膜的光子固化系统602。 The system then moves the substrate having a pattern of a cured film to photonic curing system 602. 本发明的一个实施例能够用各种基底工作。 One embodiment of the present invention can work with a variety of substrates. 系统能够以均匀覆盖的方式以lOOft/min连续地加工样品，或者以降低的均匀性的方式以加倍的速率加工。 The system can be uniformly covered with at lOOft / min continuously processed samples, or in a way to reduce the uniformity of the processing rate is doubled. 尽管可以相对于样品移动频闪头620,但该系统使用移动样品603经过频闪头620 的方法。  While the sample is moved relative to the strobe head 620, but the system moving the sample 603 through the use of strobe head 620. 本发明使用具有能够处理约90cmX 150cm的样品的传送带系统610。 The present invention having a conveyor belt system 610 is capable of processing a sample of about 90cmX 150cm. 其被用于在光子固化设备之下移动样品。 Which it is used to move the sample under the photonic curing apparatus. 传送带610以5至200ft/min的速度工作并受到传送器控制器632的控制。 5 the conveyor belt 610 to 200ft / min speed of the work is controlled and the controller 632 of the transmitter. 本领域的技术人员将认识到，可以使用其它传送方法例如机器人和气动装置来移动样品。 Those skilled in the art will recognize that other transmission methods may be used such as a robot and a pneumatic means to move the sample. 光子固化系统602包含光子发射源例如在频闪头620中的连接到可调节电源630 的氙闪光灯621。  The system 602 comprises a photonic curing photon emission sources such as a xenon flash lamp connected to the adjustable power source 621 strobe head 630 at 620. 可调节电源对于1微秒-100毫秒的脉冲持续时间具有5-600焦耳的能量容量。 Adjustable power source for a pulse duration of 1 microsecond to millisecond -100 5-600 joules having energy capacity. 虽然存在使用2秒至几分钟的脉冲以固化树脂的一些"闪光"技术，但本领域的技术人员将认识到，在这些应用中如果脉冲太短，即使有效果也很小，或者整个产品、基底以及膜被加热。 Although the presence of 2 seconds to several minutes using a pulse with some "flash" technique curable resin, those skilled in the art will recognize that, in these applications, if the pulse is too short, even if the effect is small, or the whole product, substrate and film is heated. 通过使用比现有系统短几个量级并且被设计为与纳米材料反应的脉冲，本发明与这些系统相区别。 By using several orders of magnitude shorter than conventional systems and is designed to react with the pulse of the nanomaterial, the present invention is distinguished from these systems. 闪光灯621或闪光灯阵列被配置为产生宽90cm长l-3cm的频闪图形。 Flash or flash array 621 is configured to generate a flicker pattern width of 90cm length l-3cm. 通过在约l-30cm的范围改变其距离样品的高度，改变频闪的强度。 By changing the height of the sample in the range from about l-30cm, changing the intensity of the strobe. 通过频闪控制631控制可调节电源630,以便以约40Hz的频率提供单个脉冲至多个脉冲。 Strobe 631 by controlling the power supply control 630 can be adjusted so as to provide a single pulse to a plurality of pulses at a frequency of about 40Hz. 将鼓风机622或其它冷却装置例如液体连接到频闪头以冷却并延长寿命。 The cooling fan 622 or other devices such as a liquid cooling is connected to the strobe head and extended life. 本领域的技术人员将认识到，存在用于产生脉冲发射的其它选择。  Those skilled in the art will recognize that there are other options for generating the transmitted pulse. 可以使用设备例如脉冲激光、斩波强光源、光偏转方法例如机械或电偏转、脉冲电弧等以产生发射。 Devices may be used such as pulsed laser, light chopper strong, light deflection methods such as mechanical or electrical deflection, and the like to produce a pulsed arc emission. 虽然本发明示出了从顶部经受发射源的样品603,但可以使膜从底部或者顶部与底部的组合经受发射源。 Although the present invention shows a sample subjected to a radiation source 603 from the top, but the film is subjected to a combination of the transmission source from the bottom, or top and bottom. 本发明还示出了在其已干燥后使样品经受发射。 The present invention also shows, after it has dried subjecting the sample emission. 当膜是湿的时将它们传送到发射源是有利的。 When the film is wet transfer them to the emission source is advantageous. 此外，可以将系统配置为通过进行（progress) -系列生产参数并量测每一种配置的导电性而自动地确定最优的设定。 Further, the system may be configured to perform (progress) - series production parameters and measuring the conductivity of each configuration automatically determine the optimum settings. 然后将产品设置设定为给出最优的膜特性的参数。 The product is then set to give the optimal set of parameters of the film properties. 在工作时，通过膜和图形印刷机601制造产品603,并将产品603移动到传送器610。  In operation, by the membrane 601, and graphics printer manufactured product 603 and product 603 to move the conveyor 610. 传送器610在频闪头620之下移动产品603,其中产品603被来自闪光灯621的快速脉冲光子地固化。 Moving product conveyor 610 603 under strobe head 620 where the product 603 is a fast pulse from the flash lamp 621 photons cured. 频闪控制631控制频闪功率、持续时间以及重复速率，而传送器控制630 确定产品移动经过频闪头620的速度。 Control 631 controls the strobe flash power, duration and repetition rate, and control the transmitter 630 determines the speed of the product moving past strobe head 620. 然后从传送器610移除样品，用于加工的下一步骤。 Samples were then removed from the conveyor 610, for processing in the next step. 本领域的技术人员将认识到，可以结合其它固化方法使用本发明。  Those skilled in the art will appreciate that other curing methods may be used in conjunction with the present invention. 可以与热固化方法并行地使用该技术，以便在较低的固化温度下且以较快的速率获得相同的结果。 This technique may be used in parallel with the heat curing process, and at a faster rate in order to achieve the same results at a lower curing temperature. 事实上，对已经印刷和固化的几个导电图形进行了测试。 In fact, already several printing and curing a conductive pattern were tested. 使图形经受氙闪光，导电性提高了两倍。 Subjected to a xenon flash pattern so that the conductive tripled. 申请人已观察到，包括大多数金属纳米粉末的纳米颗粒粉末通常非常能吸收光子辐射。  Applicants have observed that the majority of the metal nano-powder comprises nano-particles is generally capable of absorbing a photon radiation. 也就是，粉末是优良的黑体。 That is, the powder is excellent in bold. 纳米颗粒还具有比微米或更大尺寸的颗粒大得多的表面积与质量比率。 Nanoparticles further have a much larger size than the particles of micron or larger surface area to mass ratio. 最后，与体材料相比，体纳米粉末的导热性非常差。 Finally, compared to the material, thermal conductivity of nano powder is very poor. 这三个性质表明用脉冲光子源对纳米颗粒的辐照可以将颗粒瞬时加热至非常高的温度。 This indicates that three properties of a pulsed light source for irradiating the particles may be nanoparticles instantaneously heated to very high temperatures. （"光子源"为处于这样的电磁谱的辐射源，该电磁谱包括但不限于γ射线、X射线，紫外线、可见光、红外线、微波、 无线电波或其组合。）如在下面列出的几个新应用中所指出的，该效应是非常有利的。 ( "Photon source" such as a radiation source in the electromagnetic spectrum, the electromagnetic spectrum, including but not limited to γ-rays, X-rays, ultraviolet, visible, infrared, microwaves, radio waves or a combination thereof) as listed below several new applications have pointed out, the effect is very favorable. 通常，材料的催化活度随材料的表面积和温度的增加而增加。  Generally, the catalytic activity increases as the surface area of ​​the material and temperature of the material increases. 第一项的自然结果为，催化材料倾向于具有高的表面积。 The first is a natural result, the catalytic materials tend to have a high surface area. 实现这一点的一种方法为使催化材料具有纳米尺度的尺寸。 One method of achieving this is that the catalytic material having nanoscale dimensions. 作为第二项的结果，在高温下进行一些催化过程。 As a result of the second term, some catalytic processes at high temperatures. 一些催化材料为纳米尺寸的金属，所以非常能吸收辐射。 Some catalytic materials to metallic nano-size, it is able to absorb radiation. 通过用光子源泛射催化剂，催化剂将吸收辐射并加热到比系统余下的部分高的温度。 Pan shot by a photon source, catalyst and heated to a radiation absorbing system than the rest of the high-temperature portion. 这样，可以获得较高的催化活度而不显著改变系统的温度。 Thus, high catalytic activity can be obtained without significantly altering the temperature of the system. 如果使用脉冲光子源，则尤其如此。 If you use a pulsed light source, in particular. "瞬开（instant on) "或冷启动催化：由内燃发动机产生的污染的显著部分来自于工作的第一或第二分钟。  "instantaneous opening (instant on)" cold start or catalytically: a significant part of the pollutant produced by the combustion engine from the first or second work minutes. 因此，在工作的第一分钟期间，因为汽车的催化转换器的温度低， 所以其进行了非常少的催化转化。 Thus, during the first minute of work, because of the low temperature of the catalytic converter of a motor vehicle, it is subjected to very little catalytic converter. 预热整个催化转化器需要附加的电池，这在某些程度上达不到首先进行预热的目的。 Preheating the whole catalytic converter requires additional battery, which first reach the purpose of preheating to some extent. 然而，重复的脉冲强光子源能够以非常少的输入能量瞬时预热催化材料直到整个发动机变热，产生显著低的来自发动机的热散发。 However, repetitive pulsed source of photons can be very little input energy to preheat the catalytic material until the entire transient heat up the engine, significant low thermal circulated from the engine. 低温环境中的高催化速率。  a high catalytic rate in a low temperature environment. 不能忍受或不希望高温的环境例如液体环境可以具有通过光子源泛射而增加的催化活度。 We can not tolerate or do not want a high temperature environment such as a liquid environment may have flood source of photons emitted by the increase in catalytic activity. 可以做到这一点而不显著改变系统的温度。 This temperature can be done without significantly changing the system. 可以在水的沸点以下的温度实现高产的水的催化裂解。 It can achieve high yield water at a temperature below the boiling point of water catalytic cracking. 调制催化。  Catalytic modulation. 通过控制冲击（impinging)光子源的强度，可以短时间尺度地控制催化剂的催化活度，而且可以不依赖于系统的温度做到这一点。 By controlling the impact strength (impinging) photon source, short time scale can control the catalytic activity of the catalyst, and may not depend on the temperature of the system to do this. 可以通过来自另一子系统的反馈来控制催化活度。 Catalytic activity can be controlled by feedback from another subsystem. 这导致"按需（on demand)"化学反应例如燃料电池或工业化学合成方法所希望的反应。 This results in "on-demand (on demand)" such as fuel cells or chemical reaction of industrial desired chemical synthesis reaction. 净化被沾污的催化剂。  purifying the contaminated catalyst. 通过将纳米材料催化剂暴露到强脉冲光子源，纳米颗粒将被瞬时加热。 By exposing the catalyst to a nano-material source of intense pulsed light, the nano particles will be heated instantaneously. 表面上的任何吸附的材料被驱走或者反应以重新激活催化剂。 Any material adsorbed on the surface of the reaction to drive away, or to reactivate the catalyst. 用于催化合成的纳米颗粒气溶胶（aerosol)的脉冲广播辐射。  aerosol nanoparticles (Aerosol) used for the synthesis of broadcast radiation pulses. 通过将气体中悬浮的纳米粉末暴露到辐射，颗粒悬浮在其中的气体可以与颗粒催化地反应。 By gas suspended nanopowders exposure to radiation, wherein the particles are suspended in the gas can react with the catalytically particles. 这是用于裂解碳氢化合物气体的有效方法。 This is an effective method for cracking a hydrocarbon gas. 虽然使用银进行了一些测试，但申请人认识到，其它金属将呈现相同的效果并具有相似的性能。  Although silver, some tests, applicants recognize that other metals will exhibit the same effect and have similar properties. 其它材料包括但不限于铜、铝、锆、铌、金、铁、镍、钴、镁、锡、锌、钛、铪、钽、 钼、钯、铬、钒以及金属的合金。 Other materials include but are not limited to, copper, aluminum, zirconium, niobium, gold, iron, nickel, cobalt, magnesium, tin, zinc, titanium, hafnium, tantalum, molybdenum, palladium, chromium, vanadium and alloys of metals. 此外，非金属化合物例如碳同样呈现这些属性。 Further, nonmetal compounds such as carbon likewise exhibit these properties. 本领域的技术人员应该理解，这里公开的技术代表发明人发现的在本发明的实施中很好地起作用的技术，因此可以被认为构成用于其实施的示例性方式。  Those skilled in the art will appreciate that, in the embodiment of the present invention to function well in the art disclosed herein represent techniques discovered, thus can be considered to constitute exemplary embodiment thereof. 然而，根据本公开，本领域的技术人员应该理解，只要不背离本发明的精神和范围，在所公开的特定的实施例中可以做出许多改变并仍能获得同样或相似的结果。 However, according to the present disclosure, those skilled in the art will appreciate that, without departing from the spirit and scope of the invention, in the particular embodiment disclosed that many changes may be made and still obtain a like or similar result. 1. 一种烧结系统，包括： 印刷机，用于使用制剂在基底上印刷膜和图形，其中所述制剂包括具有小于一微米的至少一个尺寸的至少一种金属； 闪光灯，用于产生多个电磁发射脉冲以辐照所述基底上的所述膜； 控制电路，用于控制所述闪光灯以将每个所述电磁发射脉冲限制为具有在0. 31焦耳/ cm2至1. 42焦耳/cm2的范围内的面能量密度，并且将每一个所述电磁发射脉冲限制在1微秒至100毫秒的范围内；以及传送器，用于移动所述基底上的所述膜以定位所述膜，以便能够使所述膜经受来自所述闪光灯的所述电磁发射脉冲以烧结所述膜。 A sintering system, comprising: a printer for printing using the formulation on a substrate film and a pattern, wherein said formulation comprises at least one metal having less than one micron in at least one dimension; flash for generating a plurality of electromagnetic pulses emitted irradiation of said film on said substrate; a control circuit for controlling said flash emitter to each of said electromagnetic pulses having limited to 0.31 Joules / cm2 to 1.42 Joules / cm2 surface energy density within the range, and each of said electromagnetic pulses emitted limit in the range of 1 microsecond to 100 milliseconds; and a transmitter for moving said film on said substrate to position the film, so as to enable said film is subjected to the electromagnetic emission pulse from the flash lamp to sinter the membrane. DE3585715D1 (en) * 1984-10-02 1992-04-30 Du Pont Sintering of metallic intermediate layers in organic polymer films.